The historical track record suggests illegal immigration could rise substantially over the August level. The conventional wisdom holds that illegal immigration has fallen due to demographics and a more prosperous Mexico under NAFTA. No doubt some of this is true. Notwithstanding, US wages are still 2-3x that of Mexico and 7x that of the Northern Triangle (Honduras, El Salvador and Guatemala), even after adjusting for the higher cost of living in the US. Moreover, in one survey, a third of Mexicans stated that they would like to work in the US, and presumably that number is even higher in the Northern Triangle states. That is a potential work force in the tens of millions. We have contended that illegal immigration is primarily economic and driven by labor demand in the US. Moreover, we view the Great Recession as a depression (with all the ancillary manifestations, like rising racism and nascent fascism). Depressions take a long time to resolve, with seven to ten years not a bad estimate. But sooner or later the gloom lifts, and the traditional motors of the economy re-engage. 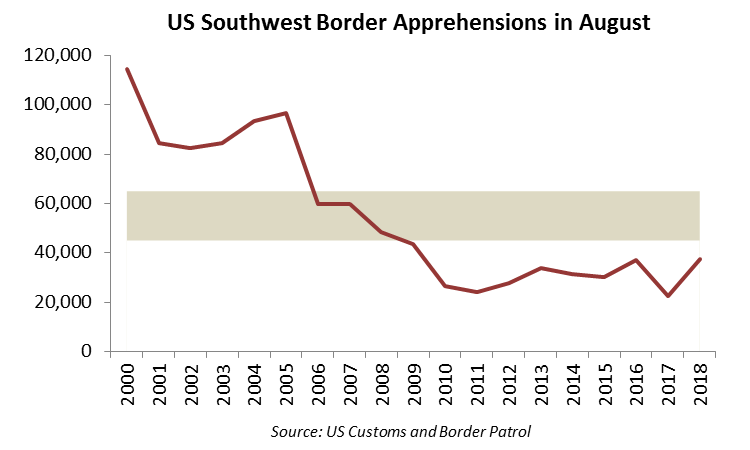 With a strengthening recovery, illegal immigration could return to levels reminiscent of pre-Recession days, that is, to 45,000-65,000 SW border apprehensions / month, 50-100% higher than the year-to-date average. Certainly, the Latin American workforce is available and US wage incentive is in place if the labor demand materializes. We have consistently argued that black markets -- including those in migrant labor -- are virtually impossible to extirpate, and that it is frankly not worth trying. Far better to take the same approach the US did with alcohol in 1933 and marijuana this decade: legalize the activity and tax it. The migrant's decision to work in the US and the US employer's decision to hire a migrant is ultimately a business decision. The US government should treat it as such and focus policy on insuring that the country (and its conservatives) are compensated at market rates for allowing migrants access to our labor markets. For both Trump and incoming Mexican president Obrador, the legalization of migrant labor could be the defining victory of their administrations.